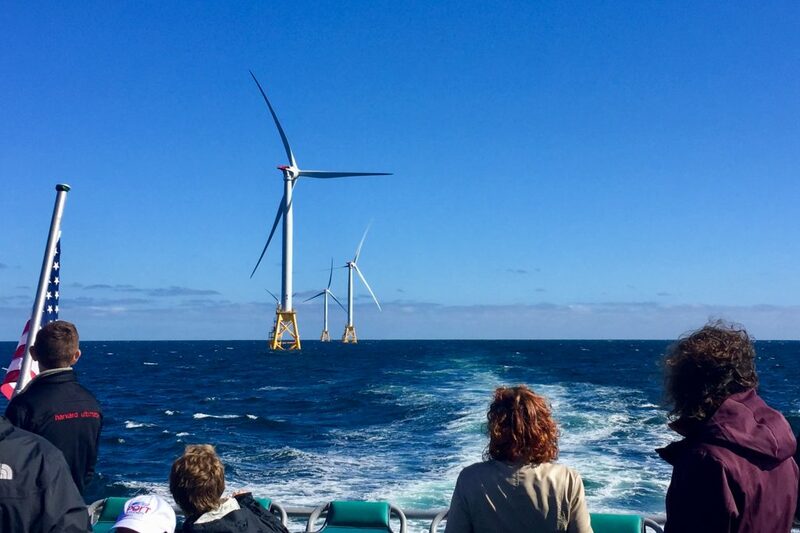 Editor’s Note: This is Part II of a two-part series documenting the retirement of the Brayton Point coal plant and how this former coal town is redefining itself as an offshore wind energy hub. For Part I of this story, click here. The only U.S. model for the industry that could repower Brayton Point is currently anchored out in Block Island Sound. From the Point Judith Lighthouse on the tip of the Rhode Island coastline, the wind farm is out of sight, as is Block Island 13 miles offshore. The horizon remains unbroken. Four miles southeast of the island, five offshore wind turbines stand in a graceful arc – the first of their kind in American waters. As we approached the Block Island Wind Farm by boat one crisp October morning last year, the turbines popped into view as small specks between water and sky. Ferry passengers on the tour, organized by the National Wildlife Federation (NWF), craned their necks to take in the new spectacle from the narrow windows of the vessel. Tour organizers gave welcoming remarks, clearly fired up about this game-changing clean energy resource. Catherine Bowes of NWF highlighted the organization’s work in partnership with developers to minimize the impacts of the wind farm on marine life, particularly the endangered North Atlantic right whale. Also aboard were leaders from the Massachusetts Clean Energy Center (MassCEC) and the Block Island project developer, Deepwater Wind. The Danish wind power giant Ørsted recently bought Deepwater to solidify its position in the up-and-coming North American market. “Seeing is believing,” said Bill White, Senior Director for Offshore Wind at MassCEC, summing up a main rationale for the tour. White highlighted Massachusetts’ 2016 legislation required utilities to purchase 1,600 megawatts of offshore wind in the next decade. This law created the first clear pathway to market for this new industry in the U.S., according to White. As the turbines neared, we flocked to the upper deck for a better view. The turbines have a boxy, bright-yellow foundation, a long cylindrical tower connected to a central hub, and three gracefully tapered blades. When the ferry pulled up alongside the first turbine, its epic scale sent a ripple of awe through the group. At 600 feet tall from sea level to blade tip, it’s comparable in size to Boston’s tallest building, the John Hancock tower. The turbine stands as tall as 12 right whales stacked end to end, and observers reacted as if they’d just seen a pod of these rare, beloved whales explode from the water in unison. 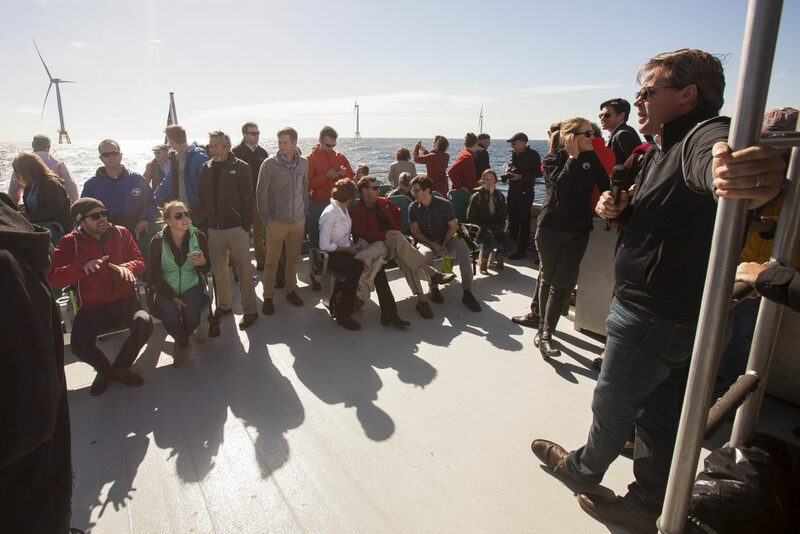 In the midst of the star-struck passengers, Matt Morrissey, the Massachusetts Vice President of Deepwater Wind, launched into an overview of the project, starting with the 6-megawatt turbines designed by General Electric. Not only are they the first five of their kind in the U.S., Morrissey noted, they are some of the largest wind turbines spinning in the world. The turbines are even larger when you consider what lies below the surface. The foundation extends 100 feet underwater to the sea floor. There, the legs are anchored to tiles that are bolted another 200 feet down. The turbines are rated to withstand storms equivalent to a Category 3 hurricane, the likes of which New England has not seen since the Great Hurricane of 1938. The blades appear feather-like despite their size. Each is over 200-feet long and curved to a tip at the end. If the base of the blade were placed on second base at Fenway Park, its length would extend beyond the walls of the stadium. Deepwater Wind’s Block Island project began generating power on December 12, 2016. In total, the wind farm cost $290 million to build and employed over 300 local workers for two seasons. Its five turbines, capable of powering 17,000 homes, can meet all of the island’s electricity needs and more. On windy days, excess power flows to the mainland grid. For Block Island and the nation, the project represents a historic milestone. This clean power source is replacing the dirty, inefficient and expensive diesel generators that formerly fueled operations on the island. Thanks to the switch, Block Islanders, who used to pay some of the highest electricity costs in the nation, will save $25 to $30 per month on their electricity bills. At a broader scale, the Block Island pilot project is “proving the case that in North America you can successfully get an offshore wind project permitted and built and power communities with it,” said Tommy Beaudreau, the first Director of the Bureau of Ocean Energy Management under the Obama administration. He sees this project as pivotal in building confidence around offshore wind in the U.S.
That is an important step for the Northeast, given its potential to become a worldwide leader in offshore wind. The international marine conservation group Oceana once dubbed the Eastern Seaboard the “Saudi Arabia of offshore wind” because of its strong, consistent winds, shallow waters, and proximity to densely populated cities. While offshore wind energy remains expensive in the U.S., a number of European developers – including Ørsted – are establishing offices along the East Coast to participate in this rapidly emerging market. Costs are expected to fall quickly, particularly with the development of local infrastructure and a well-trained workforce. Brayton Point now appears poised to play a role as part of that local infrastructure component. White sees offshore wind as critical because of the economic boost and the energy diversification that it could provide, particularly given the retirement of in-state generators like Brayton Point. Representative Haddad is not alone in worrying about the region’s over-reliance on out-of-state natural gas. Several speakers on the tour cited this dependence as problematic for long-term energy security. Massachusetts’ first offshore wind project is now on the horizon. This past summer, the state selected Vineyard Wind — a partnership between Copenhagen Infrastructure Partners and Avangrid Renewables — to build an 800-megawatt project in waters 15 miles off the southern coast of Martha’s Vineyard. White is eager to see his state reap the benefits of this industrial-scale project. The new wind farm will generate enough power to meet six percent of Massachusetts’ energy needs (roughly equivalent to the cumulative power produced by every solar installation in the state). And Massachusetts doesn’t plan to stop there. “We’re talking about a revolution,” said White. 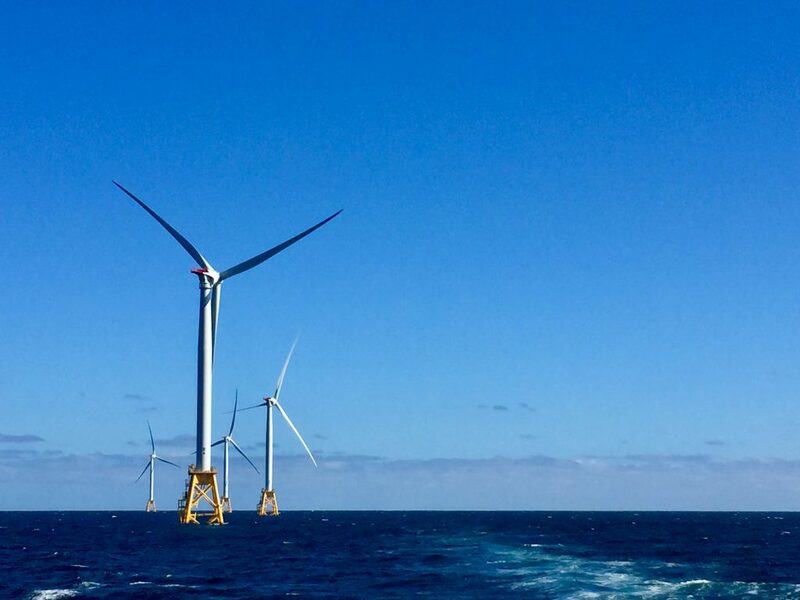 “Offshore wind could spur a rolling level of economic activity that we have not seen in the New England region for a long, long time,” said Deepwater Winds’ Matt Morrissey. MassCEC has produced several studies and workforce development initiatives to support offshore wind deployment in the state. Brayton Point was featured prominently in each. Their October 2017 report specifically highlighted potential reuse cases for Brayton Point, including as an operations and maintenance (O&M) base, a manufacturing center for turbine parts, or a foundations construction plant. CDC has clearly taken notice, incorporating a hybrid of these concepts in their redevelopment plan for the site. In another report, MassCEC and partners calculated that a “high market scenario” – 8,000 megawatts of offshore wind deployment in the Northeast by 2030 – could create over 36,000 jobs in the region. Workforce development is part of MassCEC’s core mission and the Center has commissioned the Massachusetts Maritime Academy, Bristol Community College, University of Massachusetts-Dartmouth and others to scope training and certification needs of this new industry. “We want to ensure that Massachusetts workers are ready to compete for those jobs,” said White. Leading up to Brayton Point’s retirement in the summer of 2017, the Coalition for Clean Air South Coast and its supporters held several visioning sessions to sketch out a community-based future for the site. Studies such as Synapse’s Reimagining Brayton Point showcase possible visions for this new industry. If implemented, these plans would dramatically revitalize Brayton Point, and Somerset, as a regional leader in clean power generation. Pauline Rodrigues has taken on a prominent organizing role in the Coalition over the years. She believes that Brayton Point could become a site for diverse industrial and recreational uses, with offshore wind as the anchor. In Rodrigues’ vision, the waterfront is transformed: where the coal pile used to sit, there are now offshore wind turbine components. The pier has been refurbished and reconditioned to support the weight of the hefty turbines. Crew transfer vessels bob in the water, waiting to bring the next group of turbine maintenance technicians out to the wind farms. Behind Justin, it is quiet. Other park-goers have dispersed to attend to their evening routines. Dusk settles in. The baby-blue behemoth of a plant is gone. Two smaller buildings, brown and newly shingled, stand in its place: the equipment manufacturing center and the South Coast green jobs training center. Bustling during the day, the buildings are now empty on this darkening fall day. A flyer is pinned to the training center door: Turbine Maintenance Training – Tuesday, November 3, 2025. In the photo, a man, barely visible, hangs harnessed from the blade of a turbine that stretches into the sky. Near the northwest edge of the property, several rows of ground-mounted solar trackers tilt toward the horizon. Just as the native vegetation around them, the solar panels track the sun in its daily rotation. The brown-eyed Susan, the goldenrod, and the wild bergamot are dun-colored and dormant. Puffed-out milkweed pods scatter tufts of white fluff into the wind. In the middle of the peninsula, between the buildings and the solar array, sits a long barn-like building, home to an energy storage pilot project. A new transmission substation stands in place of its predecessor near the Lee River. Unseen, underwater transmission cables transmit offshore wind energy to the 345-kilovolt substation, which can connect up to 800 megawatts of power to the grid. Beyond the horizon, dozens of turbines spin as the wind directs their synchronistic dance. The cooling towers still loom over the landscape. In an effort to attract tourists, Somerset installed an observation deck atop each 500-foot cylinder. The towers now encircle elevators as opposed to waste steam. Intrepid visitors unburdened by a fear of heights pay to be whooshed up to the deck, where the reward is a panoramic view of coastal southern New England and the distant windswept bay. A map provides visitors with history, geography, and a sense of place: “You are here.” Longtime Somerset residents visiting the plant for the first time still can’t believe it. Whether or not Brayton Point will move from its present sepulchral state into its envisioned clean energy future remains to be seen. The old plant is in the process of demolition, and CDC has launched a new website to provide updates on the site’s redevelopment. Vineyard Wind, Representative Haddad, and other stakeholders are watching closely to see when and how the Brayton Point Commerce Center will come into being. Meanwhile, environmental organizations continue to tout the direct coal-to-clean energy transition that Brayton Point embodies. “Brayton Point is a once-in-a-lifetime opportunity to show we can go straight from coal to clean energy,” said Peter Shattuck of the Acadia Center’s Clean Energy Initiative. Many questions remain unanswered. Will the site redevelopment process live up to its potential to serve as a true economic engine for Somerset? What other kinds of economic and social capital could this innovative new industry spark in Somerset? Will Brayton Point’s new owners conscientiously work to benefit the community by including innovative technology pilot projects, green jobs training, and public access to the waterfront in their redevelopment plans? And at a time of national uncertainty around the future of U.S. energy generation, could Brayton Point become a transition model for other formerly coal-dependent communities? The winds of change are variable, but Somerset residents remain hopeful they will soon be blowing in the right direction. Katie Siegner is a second-year Master of Environmental Management (MEM) student at the Yale School of Forestry & Environmental Studies. Her coursework focuses on clean energy development and she holds a work-study position with the Yale Program on Climate Change Communication. 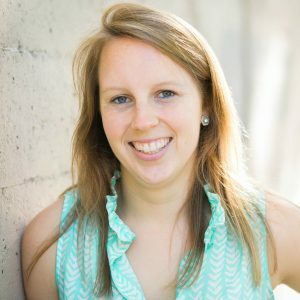 Katie graduated from Middlebury College in 2012.